Tormore Island is a gigantic leviathan, a sentinal of the deep standing guard at the nautical gates to the Slievetooey coastline. At 148m at it's highest point above the ocean it is Ireland's highest sea stack. This huge square topped stack can be seen for many kilometres along the coast either side of it. It can even be clearly seen from the Dungloe/Kincaslough road some 40KM to the north. 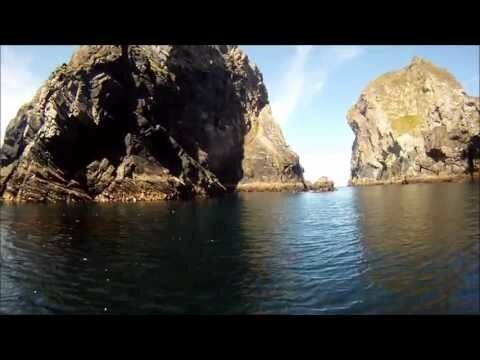 In 1895 WP (Walter Parry) Haskett Smith wrote in his book, Climbing in the British Isles Vol 2, "Outside Port lies Tormore Island, one of a group of boulders, a rock which, though hardly half a mile round its base, is a tremendous sea fowl breeding-place, second only to Horn Head. At low water Tormore can lie reached from the slime, mid it is scaled in many places by lads in search of eggs. One native was on the Great Tor when a storm arose, and cut him off from the mainland and from all help. After 4 weeks he died of starvation and exposure. Local men returned later and buried his body in a grassy area called "Borraigh Na Cahal." It is, perhaps, about 400 to 800 ft. high." Access is a very involved affair and entails gaining the storm beach as for Cnoc na Mara, Lurking Fear and Tormore Island. 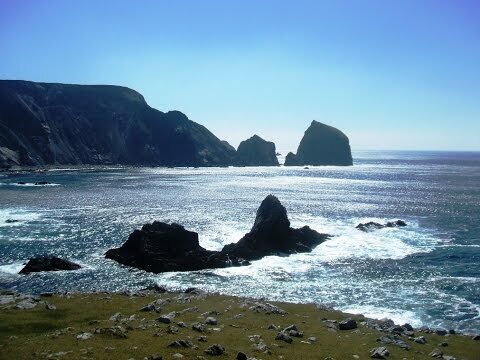 From here it is a 500m paddle around the headland to the north of the storm beach and a further 250m paddle through the outstanding channel separating Tormore Island and Donegal mainland. At the northern end of the land ward face there is a huge ledge just above the high water mark. In 2008 a team of four climbers took a 250HP RiB and landed on the land ward face of the stack. Two members of the party had made several attempts to land on and climb the stack in the past. We were aware of the story of the man who was buried here. During our climb of the stack we searched any possible place where someone could be buried and found no possible burial site or any trace of the passage of people on the stack prior to our ascent. We found no evidence or trace of previous visitors on the summit. To get off the summit back to sea level we made four 50m abseils leaving behind two 240cm slings and 4 pegs as abseil anchors. We climbed the very obvious land ward arete at the northern side of the land ward face, this huge feature can be easily seen from any position along the coast ovelooking the stack. The route we took to the summit was climbed in 5 long pitches following the easiest line up this huge feature. The descent was by 4 50m abseils down the route back to our start point on the huge ledge above the high water mark.